Like a perfect red rose, the rich color of ruby speaks of love and passion. Called the Rajnapuraor King of Gems by ancient Hindus, July birthstone is among the most highly prized of gems throughout history. The Ruby was considered to have magical powers, and was worn by royalty as a talisman against evil. It was thought to grow darker when peril was imminent, and to return to its original color once danger was past—provided it was in the hands of its rightful owner! 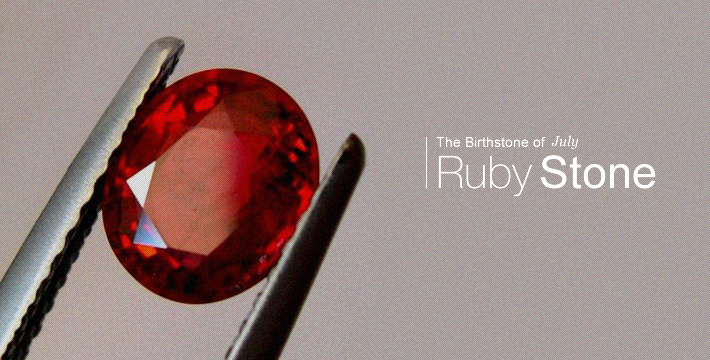 The word Ruby comes from the Latin ruber, meaning red. It is a variety of the mineral Corundum, and is found as crystals within metamorphic rock. Corundum is the second hardest mineral, after Diamond. It comes in a variety of colors, and is considered a Sapphire in any color except red, which is designated as a Ruby. Rubies range in hue from an orangey red to a purplish red, but the most prized gems are a true red in color. Large sized Rubies are very rare and valuable. It has been said that the red glow of ruby comes from an internal flame that cannot be extinguished, making a gift of this stone symbolic of everlasting love. With its hardness and durability, it is a perfect engagement gem. And if worn on the left hand, ancient lore has it that the Ruby will bring good fortune to its wearer, too!